In this article we look at a few ideas and suggestions on how to reduce the running costs of your swimming pool. How can I lower the running costs of my swimming pool? Your own swimming pool at home is something that you, your family and probably your friends all love, but no one likes seeing bigger bills than they have to and certainly no one wants to waste money. The running costs of a swimming pool fall into three major categories; energy, water and chemicals. Saving money in any of these areas is well worthwhile and even savings that at first seem quite small add up over time. In addition to saving money out of your own pocket, reducing your pools consumption in any of these three areas will reduce the environmental impact of your pool in regard to chemical use, water and energy use and it’s carbon footprint. When you save water in your pool, you are not only saving money on your water bill, you are also saving energy and reducing the cost of your pools chemical use. That is because, any water that your pool wastes has already absorbed the cost of heating it and of treating it. Water saving has also become an increasingly important environmental issue. There are lots of ways of saving water in your swimming pool. Obviously, whether indoors or outdoors, your pool loses water from evaporation. When your pool isn’t in use make sure that it is always covered. On an outdoor pool a solar cover will help prevent evaporation and also help to heat your pool on sunny days. With an indoor pool, a thermal cover will cut down evaporation and also help to keep the heat in the water. Drainage channels around the edge of your pool will save the water that is naturally splashed out by bathers swimming or playing in the pool and return it to the system rather than letting it go to waste. One of the biggest causes of water use in your pool is backwashing and there are two ways to save water in this area. The first is to change from a sand or Diatomaceous Earth (D.E). filter to a cartridge system, as cartridge filters don’t need backwashing. The other option is to install a MultiCyclone unit that works as a pre-filter between the pump and the main filter. The MultiCyclone requires no power and has no moving parts but generates a centrifugal current inside the unit that spins out and traps particles before they can reach the sand filter. A MultiCyclone therefore means that the sand filter has to be backwashed much less often and that can save you as much as 7,000 litres of water a year. UV water treatment is now a practical option for residential swimming pool owners, the UV options now available from leading water treatment specialist Triogen include cost-effective TR2 units which save on both capital and running costs while improving water quality. Your pool’s energy use falls into three main areas; pumping and filtration, heating and lighting. It may be worthwhile to consider upgrading your pool filtration system depending on the age of the pool, as new and more efficient pumps are available together with more efficient forms of filter media. Perhaps you should also consider replacing older devices with new, digital control units that are more accurate at maintaining filtration running times and pool temperature. Even without these equipment upgrades you can help to reduce your pool’s energy bill by keeping as much dirt and debris out of your pool as possible – and a pool cover will help do that – and by getting bathers to shower first. This should mean that the pool would need less filtration. Always try to ensure that the filtration system is used for the minimum amount of time necessary and isn’t on a timer that is set to cope with your pool’s highest bather load. A pool is typically heated to about 28 °C. A good pool cover will help keep that heat in. As you can see, a pool cover is pretty much an essential piece of equipment for any pool. DEL produce a wide range of pool covers, from slatted covers that are manual or automatic – and their automatic covers can be solar powered – to the Ultima, which is a four seasons cover. DEL also produce polycarbonate slats – either for their own covers or as replacement slats for an existing pool cover – that absorb and retain the suns heat acting as a solar cover for your pool. 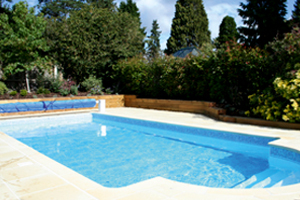 There is a range of different ways that the pool can be heated and some are more cost effective than others. Heat pumps are a very efficient way of heating your pool or a good solar thermal system, installed in the UK climate, could help raise the unheated water temperature by 6 to 10 °C from May to September, depending on the weather conditions. Economically priced and suitable for all types of outdoor swimming pool, DURA and DURA+ heat pumps benefit from oversized, titanium heat exchangers making them highly resistant to corrosion by salt, chlorine and bromine. Both of their models models are suited to UK climate with the Dura+ able to provide all year heating capability and show a significant saving on energy bills. It’s a good idea to see a solar installation as an addition to your existing heating system rather than a replacement. The solar panels top up your pools heat most effectively just at the time that you are most likely to want to use your pool, taking the demand off the traditional system and reducing your fuel bills as well as the environmental impact of your pool. There is more information on solar heating for your pool here. After filtration and heating, lighting is your pool’s other main use of energy. The most efficient lighting set-ups on the market today are LED units. LED’s use a fraction of the power of other light sources and are extremely long lasting. The LED’s are perhaps 6 or 7 times the cost of traditional bulbs but they will use about a tenth of the energy to generate the same amount of light and will last at least 25 times as long so there is both an immediate saving and an on-going cost reduction. EVA Optic design and manufacture a range of LED lighting specifically for pools and the harsh environment of a pool room. The lighting units van be DMX controlled to produce an infinite range of mood lighting. Alternatively, the Spectravision range of lights transform any pool into a night time oasis of glowing colourful warmth by combining the vibrancy and brilliance of LED with the soothing effects of colour. The Spectravision lights also can give an ultra white light. It is possible to have a saltwater pool that will never need to have chlorine added to it. A saltwater pool does use chlorine to sanitise the water but the chlorine comes from a chlorine generator that uses electrolysis to produce hydrochlorous acid. About 75% of all new pools built in the USA are now saltwater pools and they are becoming more popular in the UK. There is more information on saltwater pools here. If you choose not to invest in a saltwater pool, then you can reduce the amount of chemicals your pool needs by reducing water loss due to evaporation – that’s right, by fitting a pool cover – and by reducing water loss through backwashing as we’ve discussed above. We hope that this article has been interesting and informative and if there are any specific areas that you are interested in, we can help you find a suitable pool professional in your area. You can start that process by using the contact button at the top of this article. If you would like to comment on or add to this article please do so by using the reply box below. Jamie helped to build his first swimming pool in the Summer of ’76 and has been in and around pools ever since. Having worked in pool construction, operations and sales, very few people in the UK wet leisure industry have a broader or deeper knowledge of the wet leisure industry. 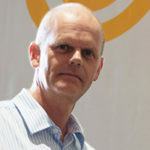 A keen fitness enthusiast and cyclist, Jamie is on the board of the British swimming Pool Federation (BSPF) and Chairman of PIP, the Pool Industry Promotion group.